Like the Geiger Kit in the previous post, this project is going to get too big to properly handle in a blog format. So it's introduced here, but the function and build details are posted on this website. I think I’ve covered the first two with the GK-B5 and the GK-Plus Geiger kits. So this project is intended to cover the 3rd need - a stationary monitoring device. There is more information on these new "RadMon" kits here. 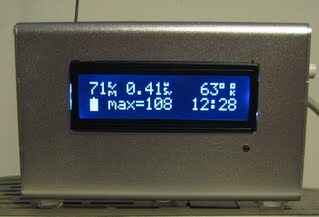 The idea is simple – a box outside with a Geiger counter and radio transceiver (solar powered as an option) talking wirelessly to a box inside with a display and an SD card. the outside piece . . .
the outside piece outside . . .
the inside piece . . .
Again, you can find all the details on this website. However, I'd appreciate any comments you'd like to leave here.